Brown ground beef and onion in large skillet over medium heat. Reduce heat to low. Add in one packet of Chili Seasoning Mix and 1 can of diced tomatoes. Stir and simmer just until well blended. Remove from heat. Add beans, crushed tomatoes, tomato sauce, diced tomatoes and beef mixture to cooker. Add salt, black pepper, crushed red pepper, and chili powder. Stir to combine all ingredients. 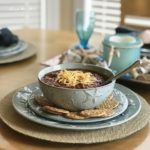 To serve, place chili in bowls and top with shredded cheddar cheese.